As Facebook has really compressed the image I uploaded on my page I thought i'd upload it to my website. After having some personal issues with social media, bland photos in my streams (social media noise, should i give it a rest) getting the shits with my progress (business and printing) I think I have pull another image out of my arse, that hopefully someone will like. Now i'm adding to your digital noise sorry. About the image..titled "Ocean Thoughts"
These nice jagged rocks are just to the right of Camel Rock and while I was waiting for the others to come back from around there I decided one last image before I headed off for breakfast. I was looking at them and I can just see before I even start what it's going to look like in my mind, playing it out in my head. I could see the leading line from the creek out to the rocks with the flow of clouds streaking by. Tip: If setting up a tripod on these outlets make sure you push down on the tripod legs to steady it because the water flowing will soften the sand and make the tripod sink down during your exposure and therefore the static subjects will blur. This is one of those images that really mean more to me than appealing to others. What i mean by that is this area of the Central Coast used to be traveled by the early pioneers of the area. My family is from the Wyong area so it's home to me. You can't really see it, but the point of land in the distance is an old jetty made of rocks called Tuggerah Wharf. I couldn't get around the fence to get over to the jetty so this is where i had to take my one and only image. 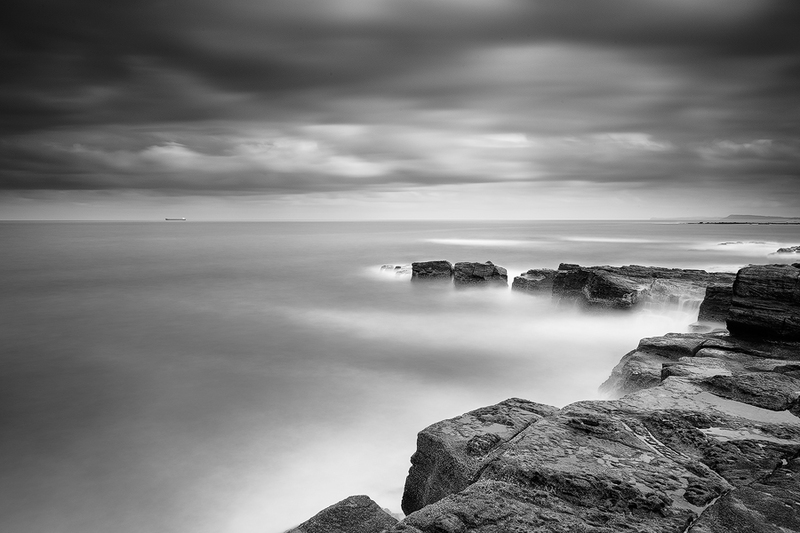 I had a great time on the weekend past with the Flickr Focus group at Forresters Beach. I also had a little frustrating time trying to capture the big waves smashing against the rocks while it was dark before the sun rose. I was trying something i don't normally do, that is freeze waves with faster shutter speeds. That meant wide apertures and higher ISO's. I did do some of these and i didn't feel free and comfortable. So after sunrise there was enough light to get out the Lee Big Stopper and create a great Long Exposure if i do say so myself. I was feeling great after this and then went to breakfast with some of the crew from the meet up. Nothing like a coffee after a photo shesh. We had breakfast at Point Cafe, Wamberal. A big wave captured and uploaded straight out of the camera. My final image i was happy with called "Forresters Spa"